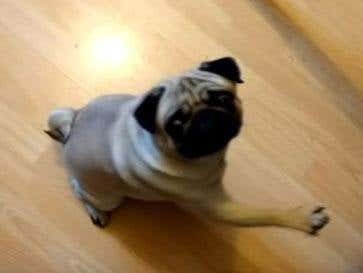 Is this pug giving a Nazi salute? At first I thought, you have to be kidding me… a guy who teaches a dog to lift its paw is guilty of a hate crime? Has political correctness lost its marbles? Then I read the article. The dog was taught to respond to classic and extremely offensive phrases, such as “gas the Jews”, or “Sieg Heil”, then the perp released a video of this travesty on his youtube site, whence it went viral. The perp’s defence was that he only meant to annoy his girlfriend – and what kind of boyfriend even wants to annoy a girlfriend, doesn’t seem like the kind of things friends do – and to have it seen only by a few other presumably like-minded friends. Some friends. His lawyer argued he couldn’t possibly have foreseen it would be seen and appreciated by millions. Ha. A good few dozen hours of community service sounds like the ticket for this joker. Previous Previous post: Will the Tories stop taking Russian money?